Summer has arrived, and we’re all getting ready for barbecues and beach trips. Unfortunately, as much fun as summer brings, it can also bring just as many dangers. That’s why you have to make sure you’re prepared for these summertime hazards so you can go out and enjoy yourself. Here are four common summer health problems, as well as how to prevent them and what to do if they strike. Dehydration: This is a major concern in the summer. People are always going out and having fun, but they don’t think about how they might end up passed out on the floor. Dehydration can lead to many problems, including but not limited to weakness, fainting, and heart palpitations. To help prevent dehydration, make sure that you and your family drink lots of fluids but don’t drink alcohol because that will increase the likelihood of dehydration. Wear lightweight and light-colored clothing and if you’re exercising or working outside, stop, take a break, and replenish your fluids, especially before you get too tired. If you believe you’ve become dehydrated, make sure to continue drinking fluids. Don’t just down an entire bottle of water in three seconds; try other ways to gain your fluids: small sips of water, electrolyte drinks, popsicles, etc.. Make sure that you’re still wearing lightweight clothing and try to stay in a well circulated area. Use misting fans and spray bottles to cool down or an ice pack, but don’t place the ice pack directly on your skin. You can buy a D-FantiX Handheld Water Misting Fan for $19.99 as of July 1, 2016. Bug Bites: Bugs. Suddenly, they’re everywhere, and they aren’t going away anytime soon. So, always remember to use bug spray when you’re going out. For those who don’t trust the chemicals inside of bug spray, check out this article for homemade mosquito repellent, and check online for other natural bug repellent recipes. If you’re going to parks or hiking, wear sneakers and long socks and avoid traveling in the high grass. Bug spray is no substitute for sunscreen so still put sunscreen on and then put bug spray on afterwards. Should you get bitten by a bug, here’s what to do: stay calm and get as far away from the insect as possible because there may be more. Do not scratch or pick at the bite; instead, clean the area with warm water and soap. To relieve this, first try rubbing alcohol on the spot with a cotton ball. The irritation should gradually go down, but if alcohol doesn’t work, get a bacitracin ointment and place it on the bite before covering it with a bandage. Sunburns: If you’ve never experienced the redness, tenderness, skin peeling, and even blisters that can occur with a sunburn, then consider yourself lucky. To protect yourself and prevent your skin from getting permanent damage, first thing first: sunscreen. Apply it and make sure to use a high enough SPF for your skin type. You may not think you need it but you do. For further protections, wear wide brim hats and sunglasses since prolonged sun exposure is linked to eye damage such as cataracts or temporary visual impairment. If you weren’t able to protect yourself and end up with a wicked sunburn, cool it down as fast as possible. Whether it’s getting in a bathtub or an ocean, cool down for just a few seconds before wrapping up to keep your skin protected. You can keep cooling down your skin with cold compresses or ice bags; just be sure to wrap the ice – don’t put it directly on your skin. Moisturize your skin over the time that it’s healing. You can take some ibuprofen to help with the pain and make sure to keep drinking water to stay hydrated. If the pain persists, be sure to see a doctor. 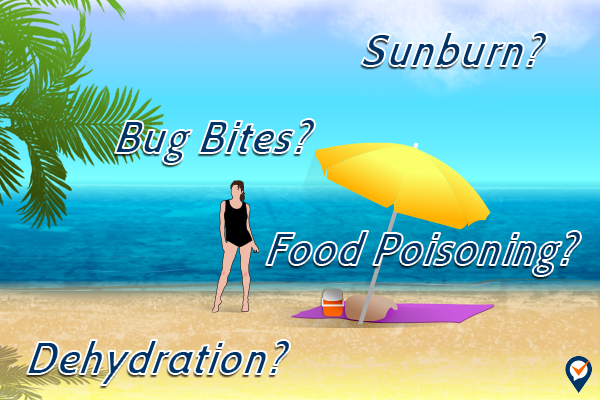 Food Poisoning: This doesn’t seem like your usual summer problem but think about it. With summer comes a lot of cooking and a lot of eating outside. Picnics, barbecues, family reunions, these are all opportunities for food to come into contact with something it shouldn’t. To keep yourself and those you cook for safe, remember to wash your hands, utensils and workstation before and after cooking. Also, make sure your food is cooked thoroughly; that’s where a meat thermometer comes in handy. You can buy a best-selling Habor Instant Read Cooking Thermometer for $12.99 as of July 1, 2016. Also, be certain to pay attention to those expiration dates. Now, you don’t really have control over what your family does and cooks. Aunt Ethel might have seen a new recipe that she just had to try. You eat it and then it hits you. Now, there are varying degrees of food poisoning, so it’s always important to see a doctor and get a proper diagnosis. In many cases, you will feel ill for several days, but it will pass on its own. During this time, it’s important to drink plenty of fluids to keep hydrated. (Seems to be a recurring theme with summer problems). But it’s possible that the food poisoning could be severe and in that case, you will require antibiotics and possibly more treatment. Have fun this summer, but don’t forget to take care of yourself. Be careful and enjoy the rest of the season. This entry was updated on Thursday, July 7th, 2016 at 2:35 pm. This entry was originally posted on Friday, July 8th, 2016 at 5:00 pm	and is filed under talklocal. You can follow any responses to this entry through the RSS 2.0 feed. You can skip to the end and leave a response. Pinging is currently not allowed.